What’s the only thing more daunting than waiting to find where you’re going to college? For many students and their families, it’s figuring out how to pay for an education. Fortunately, there are many sources of funding for college that can make attending the school of your dreams a reality. As a matter of fact, New York residents have access to more sources of funding than ever before. As of April 2017, New York became the first state to offer tuition-free college at in-state public universities to families making under $100,000 via the Excelsior Scholarship. The goal of the Excelsior Scholarship is to create a more educated workforce in the state of New York — after recipients finish their college education, they are required to live and work in New York for the same number of years they received funding from the scholarship. If you don’t plan to stay in New York after graduating from college, there are plenty of other opportunities for funding your education. Here are the four steps all New York residents should take before embarking on their college journey. The first step all U.S. residents should take towards paying for college is filling out the Free Application for Federal Student Aid, more commonly known as the FAFSA. We’ll be the first to admit it: the FAFSA isn’t exactly a fun form to complete. However, it’s essential to fill out the FAFSA if you’d like to be considered for federal or state financial aid. If you find yourself getting stuck while filling out the application, our handy FAFSA guide helps break down the form question-by-question, describing why each question is asked and how to best answer it. You don’t need to know where you’re going to college in order to fill out your FAFSA — in fact, it may be in your best interest to fill it out on the earlier side. That way, you won’t risk missing out on grants or scholarships that have earlier application deadlines. As we described above, you will automatically be evaluated for eligibility for some New York state grants (read: free money provided by your state) after you complete the FAFSA. However, some state grants require a separate application. Several of these will be linked to the end of the FAFSA so don’t forget to fill them out. In addition to grants, New York also offers several scholarships based on merit, financial need, career interest, and military service. A complete list of New York state scholarships can be found at www.hesc.ny.gov, a website run by the New York State Higher Education Services Corporation. In order to stay up to date on local scholarships, set a recurring reminder in your calendar to check in with your school guidance counselor at least monthly. They will often serve as the liaison between grant-giving organizations and interested high school students, so it’s important to start a conversation with your counselors to about local opportunities for funding. You should also try doing some research on your own. Many public and private schools in New York offer scholarships to incoming freshmen. The best way to find out about these opportunities is to search the websites of the schools you’re interested in and call their financial aid offices. You can also see if your local Rotary Club or other community organizations offer scholarship funds. For example, SUNY Geneseo lists several community scholarships for residents of Western New York here. Additionally, we offer a Nitro Scholarship and Nitro Parent Scholarship in the amount of $5,000 quarterly. All U.S. residents and parents of residents attending their first year of college are eligible and encouraged to apply. If you’ve exhausted all of the available resources for grants, scholarships, and federal loans, a private loan may be just what you need to cover the cost of your education. Before taking out a private student loan, take a look at our free NitroScore tool. It’s extremely straightforward: just enter your desired college, major, and available funding (from scholarships, grants, savings, and earnings). You’ll then receive a score based on the loans you’ll need to take out and how easy they will be to pay off with your anticipated salary. 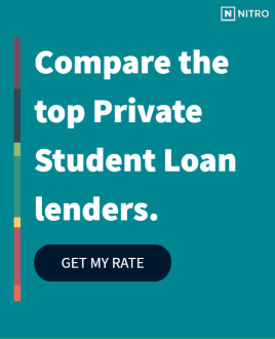 From there, you can browse our side-by-side comparison of the best banks for private student loans to find out who can give you the best rates. There are a lot of ways to make your college dreams a reality. Bring your dreams to life by planning today.